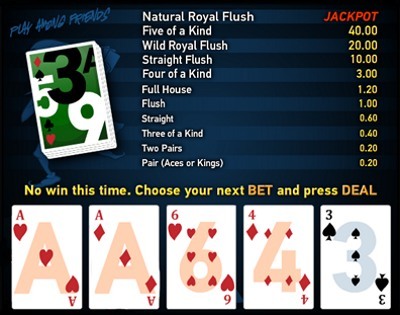 Friendly Joker Poker is exciting multi-player video poker game offered exclusively at PAF casino. It's all about having fun with friends while trying to achieve the most optimal poker hand. You'll start with creating your avatar and choosing which friends you want to follow on your screen. The highest possible win is the jackpot which starts at 100,000 euros on the highest bet level. Just hit a Natural Royal Flush. A standard 52 card deck with one joker is used, 53 cards in total. The deck is reshuffled before the start of each hand. Select your bet by clicking BET button. Click DEAL to deal the initial hand. Your first hand of 5 cards is then dealt and you can hold one or more cards. Click HOLD under the card(s) you wish to hold. You can hold from zero to five cards. If your initial hand already is a winning hand, the winning cards are held automatically, but you can change the selection. Click DEAL to discard the cards you choose not to hold. If none of the cards are held, all five are replaced. If you win, you can choose to either collect your winnings or to play "Double or Nothing" gamble game. Whenever you win you can click COLLECT to take your winnings, or try to DOUBLE them. A single card is dealt and you guess if it is higher or lower than seven, using the HIGH or LOW button to give your answer. If your guess is correct, your win is doubled, and you get the chance to double again. An Ace counts as a low card (1). If the card is a seven, the game is tied. The Double or Nothing game is played with a deck of 52 cards (with no joker) and the card deck is reshuffled before each double round. The highest possible amount you can try to double is 1,000 times your original bet in the main game.